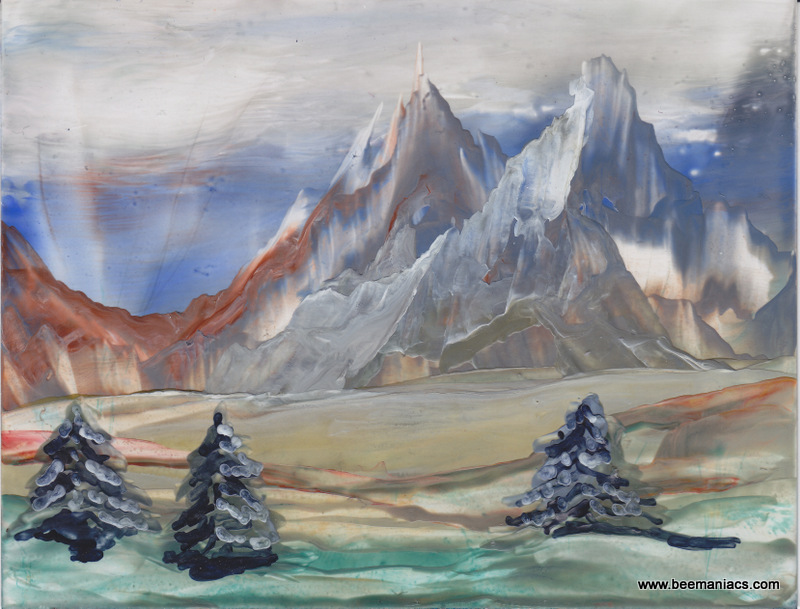 The word “Encaustic” means “to burn in” and the technique consists in painting with beeswax mixed with pigments and fixed with heat after its application. This technique is one of the world’s oldest art forms and was first practiced by Greeks 500 years B.C. 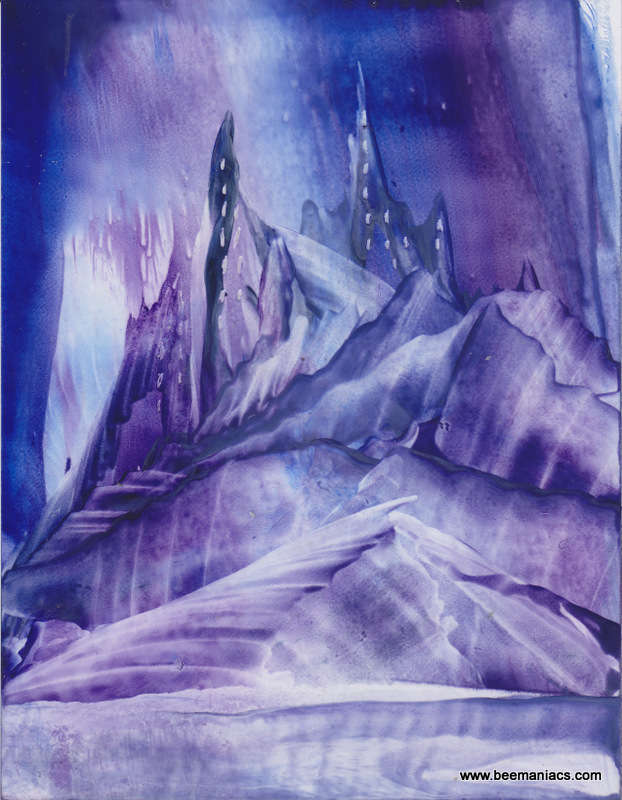 I started painting with beeswax in 2010 and from the first day on, I could not stop making all kind of greeting cards and paintings of different sizes. 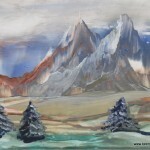 Below are some examples of my encaustic paintings. 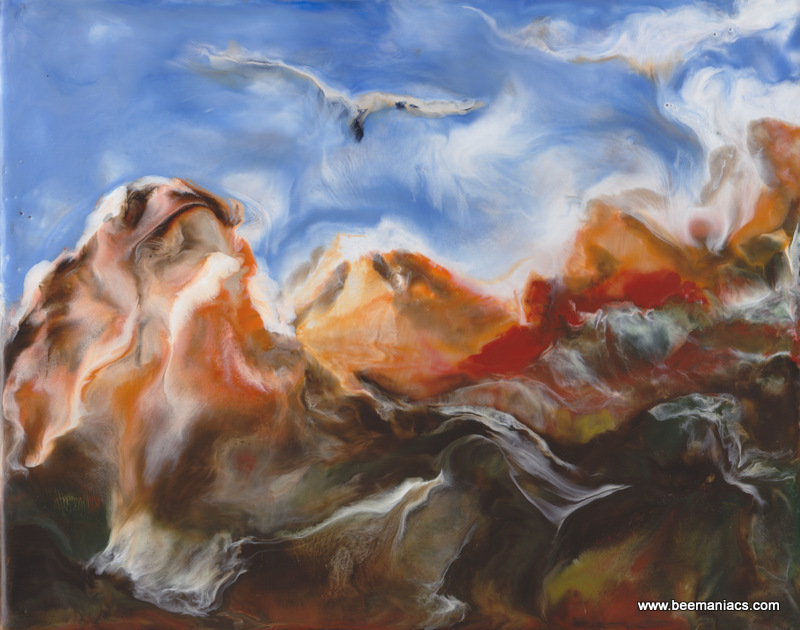 If you like to have more information, please click here. Each year the color of the mark changes, so you know exactly how old your queen is. 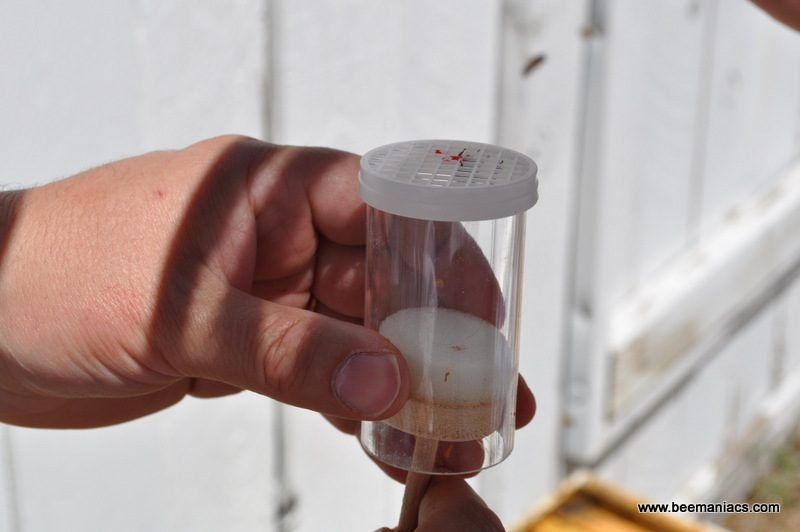 The queen is marked with a dot of paint on her thorax (the part of the body between the head and the abdomen), and to be able to mark the queen, you will need to use a device that will help you in this task. There are different varieties of queen marking paints in the market. We bought some time ago a pack of 5 pen type markers and these are the ones we use every year. The mark should be small, in this way will not cover any other part of the queen body. Many times, the queen that comes in a package comes already marked. But this is not always in this way. 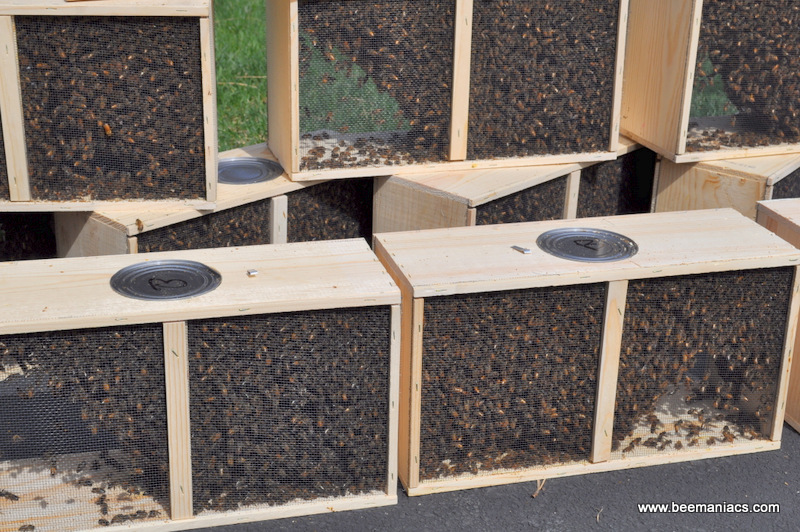 If you are a new beekeeper and bought an unmarked queen we can help you a little by showing the way we do this task. small plastic tool that opens when you squeeze the handle. 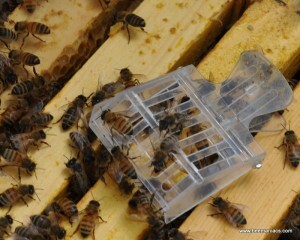 Once the catcher is totally open put it over the queen and very carefully close it. Second step is to introduce the queen in another tool called “tube marking”. 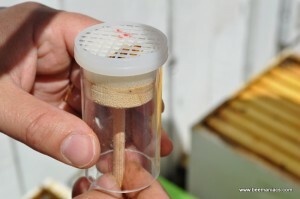 It is a clear tube with a plastic mesh in the end. The tube is were you will literally (and again, carefully) drop the queen in. 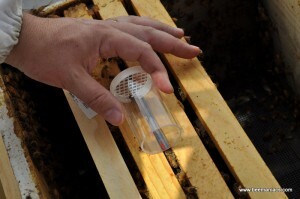 Once you have the queen inside the tube, is time to use the “plunger” which is a little stick with a sponge in the end. 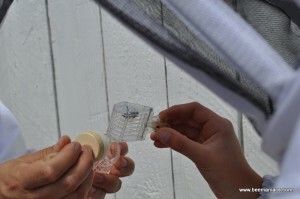 Slowly you will start “pushing” the queen with the sponge until she is barely touching the plastic mesh. Be careful in this step and don’t squeeze so hard. Now you have the queen in the correct position. 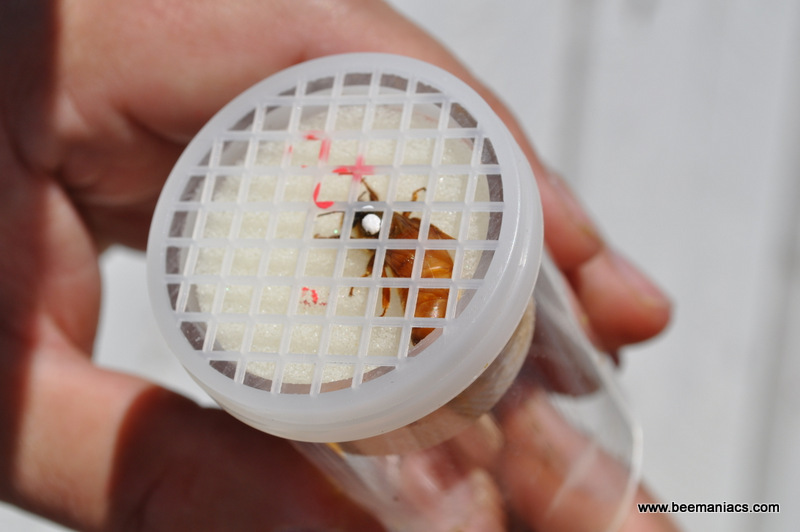 You have her thorax on the top and she can’t move at all, but don’t worry, these tools are specially design for this task, so, if you work with care, the queen will not be hurt at all. It’s time now to finally mark the queen. For this just need to use the pen with the correct color for the present year, and make a dot in her thorax. 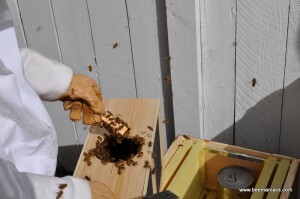 Wait a few seconds to allow the ink to dry completely and then you can release the queen in the hive again. While you wait for the ink to dry, you can take a look and verifying that she is doing OK.
To release the queen inside the hive, we just open the tube and lye it on top of the hive, you will see the queen walking to the end of the tube and quickly she will go inside her hive. 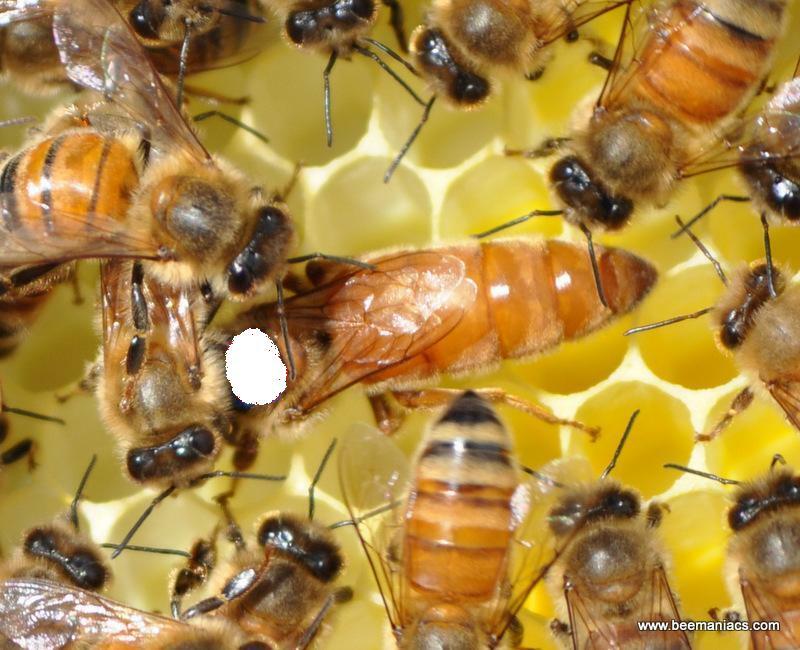 The “queen”: she is the only reproductive female in the hive, which means that all the bees in the hive are sisters. 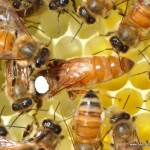 The queen’s body is larger than the rest of the bees in the hive and her primary function is to lay eggs……a lot of eggs! 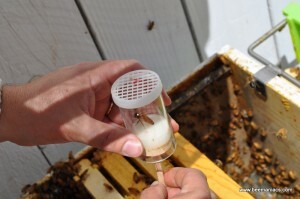 A strong healthy queen can lay around 2,000 eggs per day! The “workers”: they are all female but they are not reproductive females. 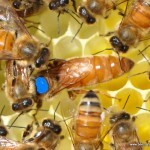 Sometimes a worker bee can lay eggs, but these are not fertile eggs. The “drones”: they are all males and their only function in the hive is to mate with the queen. If you look close in your hive, you will notice that the queen is almost always surrounded by workers, this is because the queen is totally incapable of take care of herself, so these “royal attendants” are surrounding the queen, feeding her and defending her . 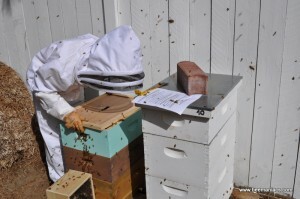 It’s the time of year again, when you check your hives after winter and you realize that you may be need some new packages for your bee yard or……. if you are a new beekeeper you will need a bee package to start your first beehive. If the latter is your case, maybe you are wondering what a “package day” is all about. Well, we can help you here showing a few pictures of our experience in this matter. 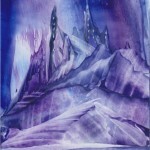 By clicking in each image, it will enlarge. We hope that they illustrate well and give you an idea of how to start. 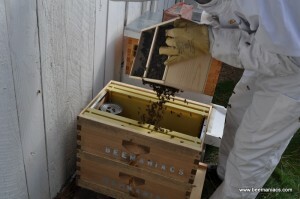 And this is the way the bees arrive. 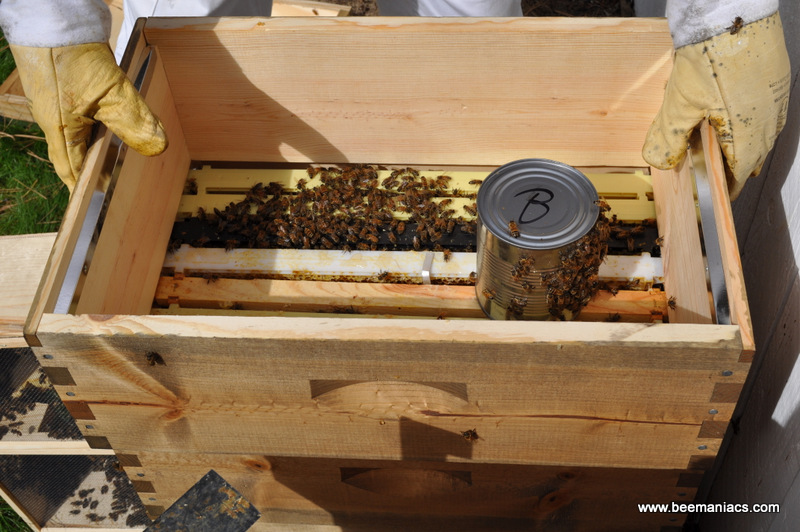 There are about 10,000 bees in a package plus a can full of syrup and the queen cage. 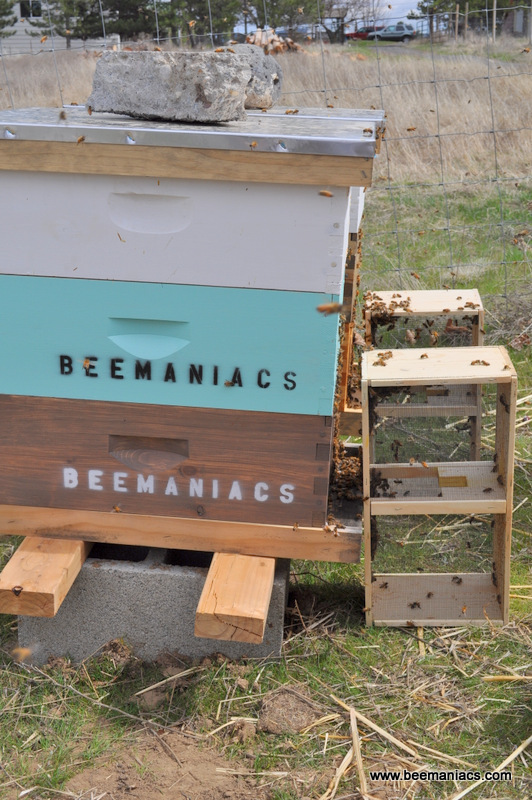 This will be the “starter kit” for your hive. To open the package what you need to do is remove the syrup can. Keep it aside since you will use it later. Since the queen that comes in the package is not the mother of the bees that come with her, she needs to be protected from them. This is why the queen comes in what is called “queen cage” and you will need to keep her inside that cage until the bees accept her in the hive. The queen cage comes with a little piece of cork, which is keeping an opening on the queen cage closed, you will need to remove it very carefully so the queen doesn’t escape from the cage, and switch it with a little piece of marshmallow. 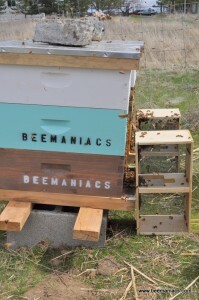 The bees will start removing the marshmallow, this will take a couple of days and by the time they finish and the cage is open; they already accept the queen as “their own queen”. Set aside the queen cage for a few minutes and then drop the whole package inside the deep. 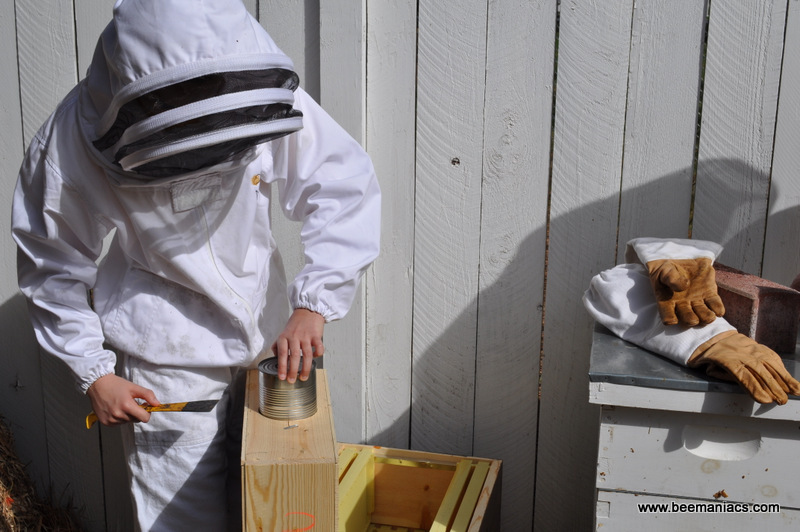 Since the bees were inside the box for several days, they will be very happy to be free and they will be all over the place, so even if they are nice at this time since they don’t recognize the new hive as their home yet, always is a good idea to wear your beekeeping suit. 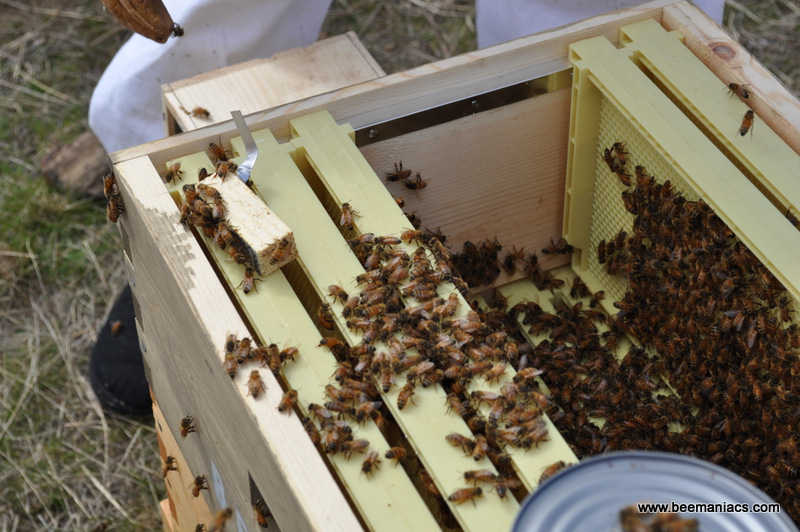 Once the bees are in their new hive, you can add some more frames in the deep but not all of them, because you will need space to place the queen cage on place. Now is time to introduce the queen in the hive. 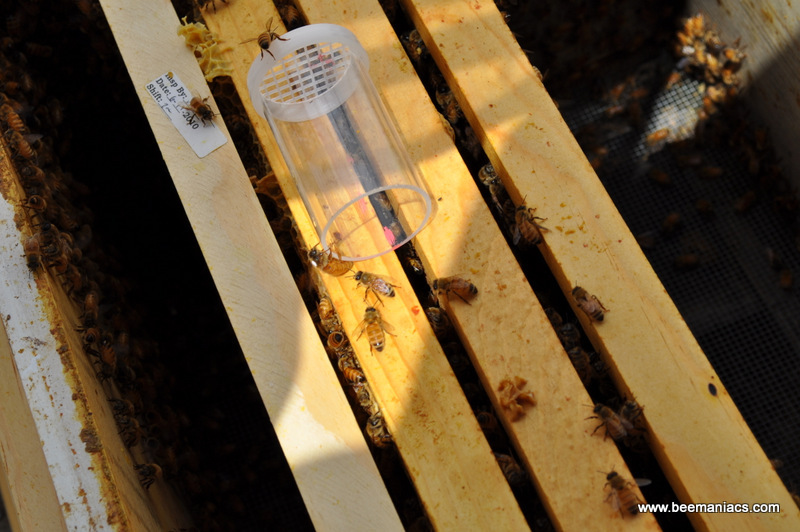 You will notice in the queen cage a metal part that will help you to hang the cage in one of the frames. 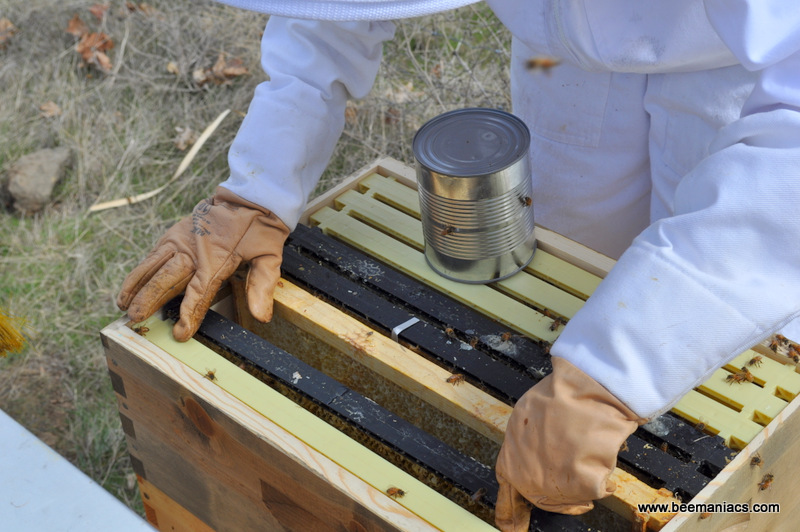 The bees will need some syrup to start building comb in the empty frames, and now is the time when you add to the hive the syrup can that come with the package. For this, you can add for a few days an extra empty box on top of the hive so the syrup can stay inside the hive. After a couple of days the bees will finished the syrup and you can remove the can definitely. 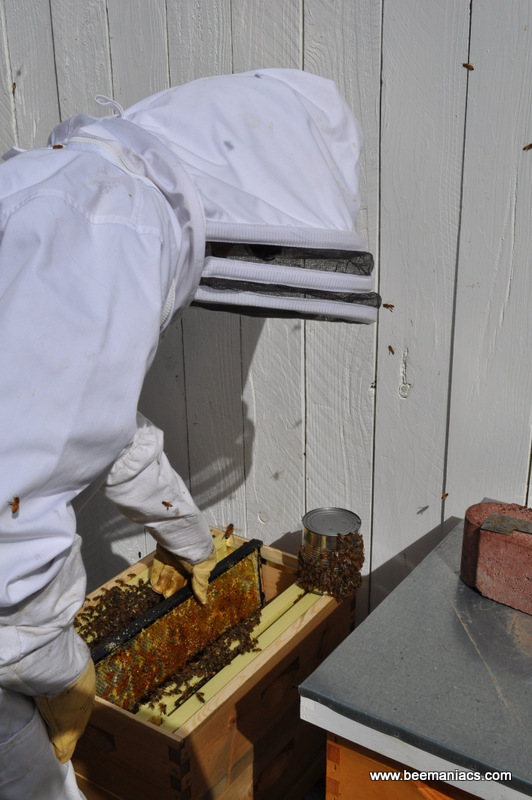 I love to take pictures of our bees and I’m always playing around with my camera trying to “catch” what they are doing….any time….anywhere. 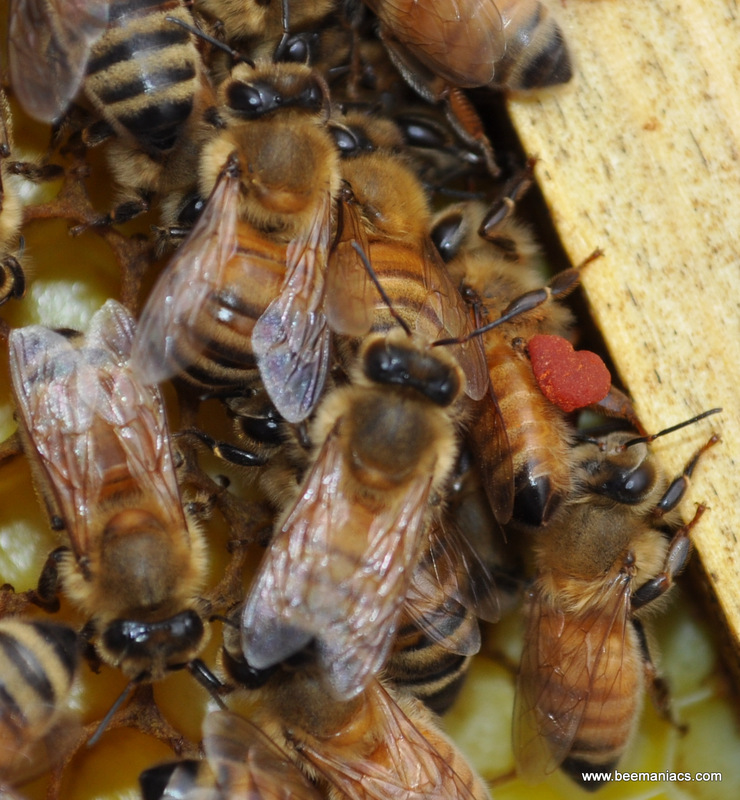 But what a surprise was for me when one day I downloaded my pictures in the computer and then I just realized that the pollen this bee was bringing to the hive had a “heart shape” and even better, it was red! So I recorded it in our gallery just to say Happy Valentine! 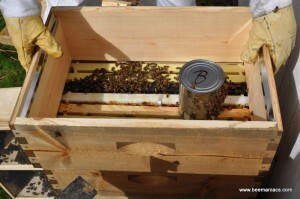 to our fellas beekeepers and friends! 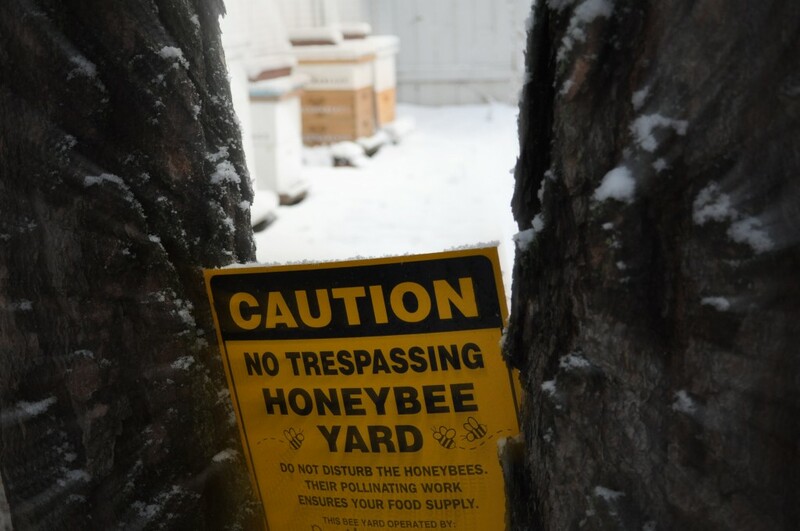 The sign in the picture below says:…..” Please do not disturb the honeybees. 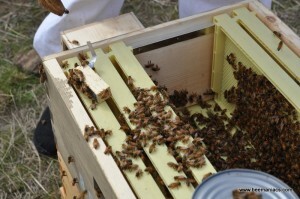 Their pollinating work ensures your food supply”. That’s truth. 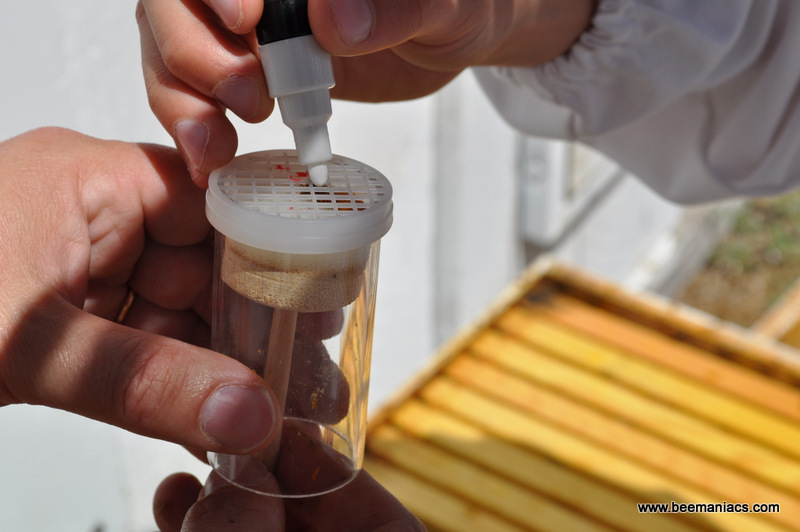 Honeybees are a inestimable value as agents of cross-pollination, and so many plants are dependent of honeybees for their reproduction. 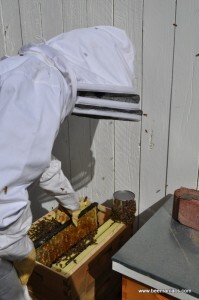 According to the U.S. Department of Agriculture, workers honeybees pollinate 80 percent of our flowering crops which constitute 1/3 of everything we eat. Losing them will affect the production of strawberries, almonds, apples and many other plants like alfalfa, which will develop in threaten our beef and dairy industries. 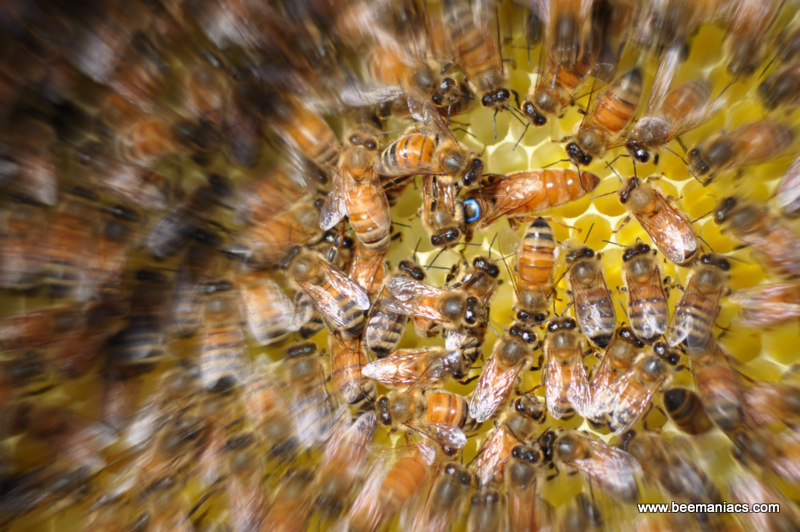 There are three types of bees in each colony: the queen bee, the worker bee and the drone. There is only one queen per hive? 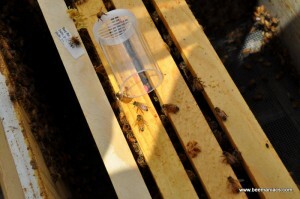 The queen and the worker bees are all female. The drones are all male. 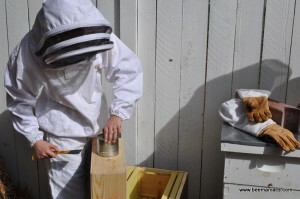 The practice of beekeeping dates back to the stone-age. 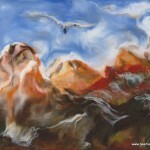 There are several cave paintings that shows this activity. 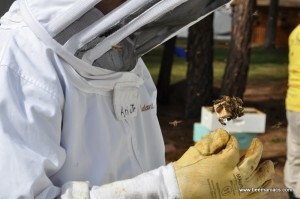 A queen bee can live for 3 to 5 years.